Thank you so much for considering a donation to Bloomington Athletic Association. It is because of people like you that BAA can continue to run 12 different boys and girls sports programs. For over 60 years BAA has been a 501.c.3 non-profit organization that allows children from K-12 to experience sports regardless of income or skill level. 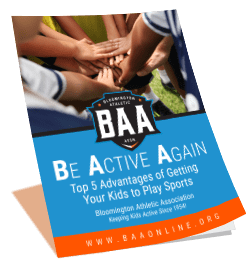 We at BAA know that your kids want to be active and at times families cannot meet the costs associated with the sport their child would like to play. This is where your donation comes in. Your donation goes towards our scholarship program that helps families offset the costs or even at times pay for the entire sport fee so that a child can play without undue stress on a families budget. Equipment is always a very large capital expense for BAA. If you are interested in helping BAA out in purchasing new equipment in a certain sport of your choosing we would love to hear from you. Because equipment is very specific to that sport, please contact the city director of the sport you are interested in giving to so they can tell you of their needs and the costs associated with the need. Please write: scholarship or (sport) equipment donation on the memo line. Once again thank you for your generous gift to BAA.